2019 is already well under way! Let me say that again: last year we kept 7,685 families close to their sick kids. When I hear numbers like that, and when I think about the impact we’ve had on each individual family, I can’t tell you how proud I am to be a part of this charity. And we couldn’t have done any of it without our phenomenal donors, volunteers and staff. Thank you, truly, from the bottom of my heart. 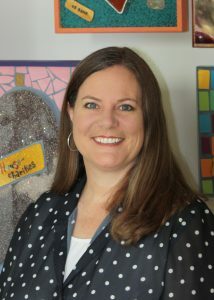 I am honored to be a part of the RMHC-KC family. And: here’s where the business side of me kicks in. Are you ready? (I promise, no spreadsheets.) As fantastic as 2018 was—it’s now a brand new year: 2019. And for us, that means the clock starts over. From fundraising to operations to volunteer support, we have a lot of work to do to ensure we can carry our mission over into another successful year. To do that, we are building a detailed strategic plan for 2019–2021 that we’re getting ready to launch. Typically, we plan in three-year chunks, and with the end of 2018, we just completed our last one. A three-year plan ensures that we’re set up for long-term growth—that we’re being proactive and not reactionary. In other words, we want to continue providing excellent care to a high number of families and plan beyond that at the same time. Keep one eye on now, and one eye on the future. When the calendar hit 2019, our fiscal year went back to $0. And our goal for the year is to raise $4 million. So we hit the ground running! We have to raise our operational revenue fresh every year, so we evaluate—what worked in the past? What didn’t? 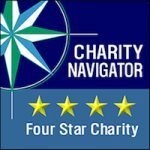 How can we deliver our mission and continue to raise the necessary funds to support our families? When you think about it, RMHC-KC is not unlike a boutique hotel, with 87 rooms filled on average every night. That’s 87 rooms that need daily cleaning. Sheets and towels that need to be laundered. Lights and electricity and all the necessities both big and little that it takes to keep things running smoothly—and to provide an environment of compassionate care and hospitality for families going through the crisis of childhood illness. Operations is a big part of our budget in 2019, as it is every year, and we’re always looking at ways to ensure our Houses are running as smoothly as possible, so that our families can focus on the health of their children. An example of that for 2019 is a new cleaning company that we’ve just contracted. In the past, our families have had to empty their own garbage and strip their own sheets. Now, we’ve found a company who can do that for us, so our families can concentrate instead on being together—and not on the little stuff. We had a whopping 17,000 volunteers last year—that’s the size of a small town! But just like our fiscal year, we started 2019 with 0. That’s how we look at it. So we have to be thoughtful about how to build, year after year, an extraordinary volunteer community and experience. We want volunteers to continue to choose us, and be engaged with our work and families, and find the meaningful work they seek. I wholeheartedly believe that the quality of care we provide for our families comes directly from the quality of care we provide for our team. That’s why we’ll continue to make it our mission to keep our employees fully motivated. We’re serious about what we do—and having fun is an important part of our job. We’ll continue to make sure our employees feel just as valued as our families do. And most importantly, our RMHC-KC families. At the forefront of every goal for 2019, and every year beyond that, will always be the families we serve. From keeping our pantries and refrigerators stocked (we went through 2,304 gallons of milk alone last year!) to offering a variety of programs and recreational activities, our primary goal is to put everything we can into serving our families. 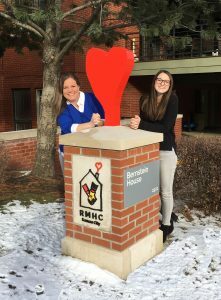 Our Event & Engagement Coordinator Mackenzie Lutz and I next to our newly installed red heart outside our Ronald McDonald House, Bernstein House. Houses on Cherry Street? Sure, we know their names—there’s our Longfellow House, our (newly named!) Bernstein House, and our Wylie House. It’s easy for us on staff to know which is which. But if you’re a family who’s unfamiliar to the area, and needs to travel easily between one of our Houses and a medical facility, and they’re all across the street from each other—how can you quickly know where to go? We finally solved that by installing colored hearts in front of the houses: now, we can just say the House with the “red heart” outside, and people unfamiliar with our campus will know right where to go. Whew! So there you go. Just a few things I’m thinking about as we start off the new year. Bring it on, 2019! We’re ready for you!